Panos Booziotes, Florida Boats. Oil on board, 9 by 12 inches. Born: August 10, 1888, Nemea, Corinth, Greece. Died: December 11, 1950, Coral Gables. Education: Wesleyan College, Bloomington, Illinois; Art Institute of Chicago, 1917 to 1922; with Charles Hawthorne in Provincetown. Membership: Florida Federation of Art; Blue Dome Fellowship; Gables Grove Artists. 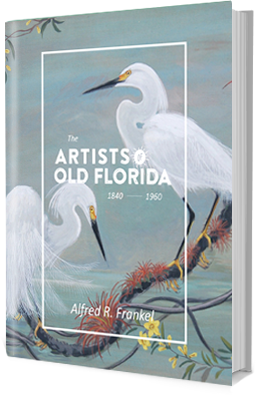 Exhibits: Terry Art Gallery, 2100 West Flagler, November 1945; Terry Art Gallery, 2100 West Flagler, November 1946, all Florida subjects. Directory: Listed in the Miami City Directory, 1944 to 1946 as a portrait artist with a studio at 140 N.E. 1st Avenue, R 214 and later, 1947 to 1949, at 3041 Grand Avenue, R4, Coral Gables.